January 20, 2018, 8:08 PM · A member of violinist.com who has helped me in the past needs our help now. When I joined violinist.com in 2004, the site was relatively new, with a much smaller membership than it has now. Because there were fewer members (v.commies, as we used to call ourselves), we formed a rather tight community. We frequently wrote about personal things on v.com, and we got to know each other as friends. 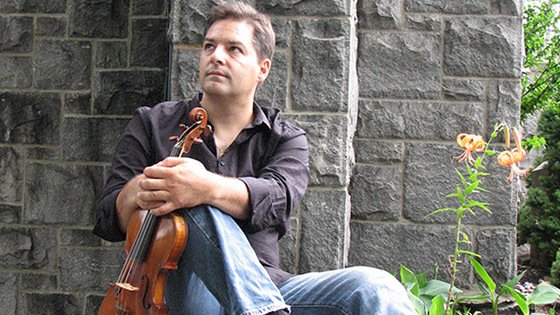 That is how I met Peter Ferreira, a professional violinist and violin teacher. He was a resourceful and personable contributor, as well as a thoroughly nice guy. Peter reached out and helped me several times, and now that he needs help, I want to help him. I am also reaching out to the v.com community to help. On two occasions Peter was especially nice to me. The first was just after I had been very depressed and had written about it on v.com. Then a number of v.commies led by Steven Brivati (Buri) did something remarkable for me. Everyone who wanted to participate played some Bach for me and wrote in to tell me what they had played. Peter played Bach's Chaconne at a recital and dedicated it to me, and I felt that I had a received a great honor. Having so many v.commies play so much Bach for me warmed and strengthened my soul, and I began to rise from my severe depression. This did not happen immediately, however, because I was so depressed that I didn't even look at v.com. Then Peter called me (I don't know how he found my number) and told me about my great gift from Bach and v.com. After speaking to Peter and reading the contributions from my v.commie friends, I felt truly blessed. Peter reached out to help me again after I had posted a query about music notation software on v.com. My dilemma was that all the free apps were horribly inadequate and I couldn't afford to buy anything. Peter called and, first, swore me to secrecy. So many years have passed that I think it's safe to discuss the issue openly. Peter had just received a bootleg copy of some fairly expensive software and he wanted to give me a bootleg copy of his bootleg copy. He tried very hard and so did I. We were back and forth with each other on the phone for three days, but neither of us had the technical knowledge to make it work. At the end of the third day, a friend who was a computer professional came over to visit me and I asked him to help. He pleaded ignorance but I convinced him to try. He fiddled around on the computer for a few minutes and -- Voila! -- it worked! Over the years I’ve stayed in touch with Peter over the Internet. I know that now he has many other pursuits besides the violin. He likes to canoe, kayak, and camp, often with his kids. He enjoys scuba diving even if it’s just in the Connecticut River. Finally, he is a devoted beekeeper. January 21, 2018 at 05:54 PM · Sorry to hear that. Hopefully we can all pitch in! Thank you for your concern and love. I love the title "Give Peter A Hand". I definitely could use a new left hand... September 8 2017 is a day I will surely never forget as it has changed my life tremendously and unfortunately not in a good way. It's been five long excruciating months of struggling not just financially and physically, but also mentally. I have had 5 surgeries and many long hours every week of physical therapy and doctor visits. I have PT three times per week that started four weeks after the last surgery. As you know I have been a professional, dedicated violinist, for the last 43 year of my 47 years on this hearth. It's very difficult for me to imagine that in an instant, the events on September 8th have perhaps ended and taken away the possibility of enjoying my dear violin forever. Thankfully, and perhaps the reason why I have gained some success in the tough music world, I am also very persistent and stubborn! As such, I have not yet "hung the violin on the wall" and have not yet given up on this battle. It's not over until it is over! I have a long road ahead. As of right now, I will be back on the operating table, under DR. Carlson's care sometime in March, followed by more extensive physical therapy. I never thought I would be so eager to get back on the operating table... But in my case, March 13th is my birthday and I am hoping for the gift of being able to move my hand more! According to the specialists, after the next surgery, and after they clean all the scar tissue in the tendons and some of the joints, I should be able to be able to start making a fist, closing my hand and moving my fingers more. Obviously with lots of therapy and time following the surgery. Perhaps than I will be able to pickup my violin again and start re-teaching my hand to play. That would be great!!!! If I could get back to being able to move my fingers on the fingerboard, both my therapist and myself believe it would also serve as great therapy for my hand and mental health. For now I pray that God gives me back the gift of playing the violin and the strength to endure the upcoming surgery and challenges that I must face in 2018. Thank you again Pauline for your kind words and to all V.com members who have expressed their love and concern for my situation. I am humbled and happy to know that there are still so many kind hearts in this world. I will keep you all posted about my situation. I feel your pain, suffering and the will to win this battle as I read through your reply. It is touching and encouraging. You are in my prayers. May the Lord put His healing hands on you, and may this special journey be a testimony to bring those who are in need close to Him again. January 24, 2018 at 04:49 PM · I had tendinitis about 30 years ago, so I can appreciate, on a smaller scale what you are going through. I was told not to play for at least two months. I went to a specialist in Boston, and a physical therapist who was able to pinpoint exactly where the problem was in my left arm. To this day I have to be conscious of whether or not I am doing something that could cause it to flare up - like playing ‘the river’ movement of Beethoven’s 6th symphony. I also routinely wear shirts that are at least 3/4 sleeve length so that it will not get cold. I send you prayers and a contribution. Good luck an God bless. January 24, 2018 at 05:42 PM · Thank you everyone. It humbles me to see how many violinists have come forth to help me in this difficult journey. I have a long road ahead, but your support and kind words have helped me in many ways not just financially but especially mentally and spiritually. It's a great feeling to know there are still so many kind hearted people in this world. Be well everyone. I will be in touch and if there's anything I can do to return your love, please do not hesitate to get in touch with me.